Are y’all ready for this? …No, no, I don’t think you are. Okay, if you insist. 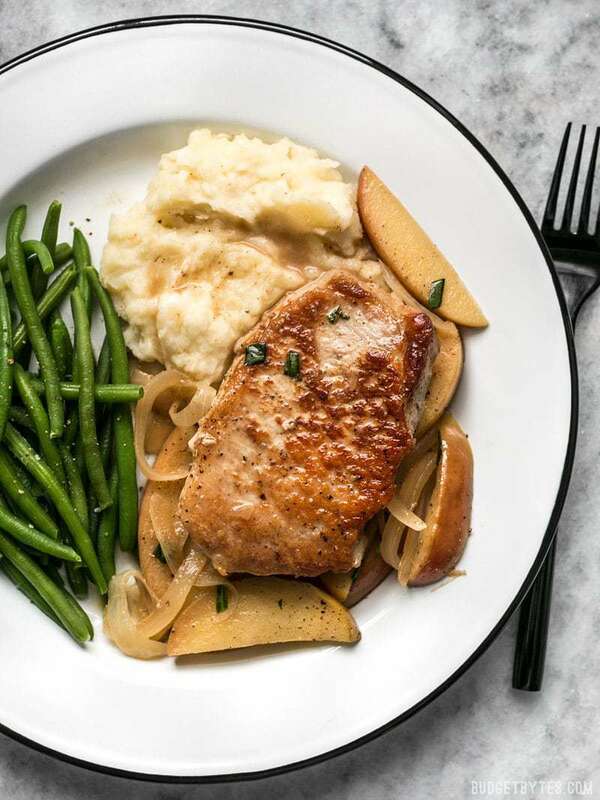 But if your head explodes upon contemplating the deliciousness of these Apple Spice Pork Chops, don’t say I didn’t try to warn you. I don’t even know if I can describe how awesome these pork chops are. The brown sugar and butter create an amazing caramel-like sauce that drenches the pork chops in a deep, rich, sweetness. Add a little spice from the cinnamon, nutmeg and black pepper and you’ve got a carnival in your mouth. Pork heaven. See this recipe used in my weekly meal prep. 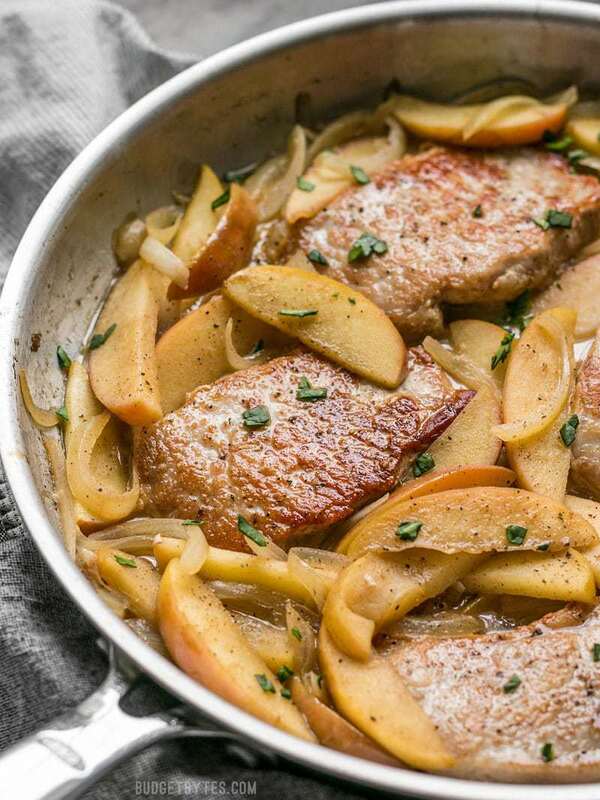 What Type of Pork Chops and Apples Should I Use? A couple of notes: I used boneless, center cut, thick chops but you can use bone-in as well. 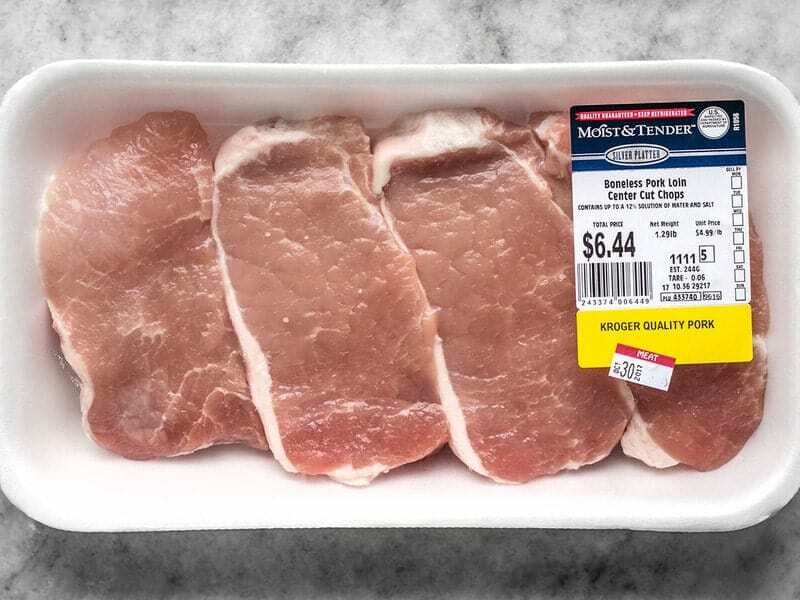 Just do not use thin cut pork chops because they will likely cook too quickly and become overcooked, dry, and tough. Shoot for something 3/4-1 inch thick. I used fuji apples for this recipe because I wanted something that was halfway between sweet and tart. I would suggest using any variety that is sweet but not sickeningly so. You need a little “acid” in there. 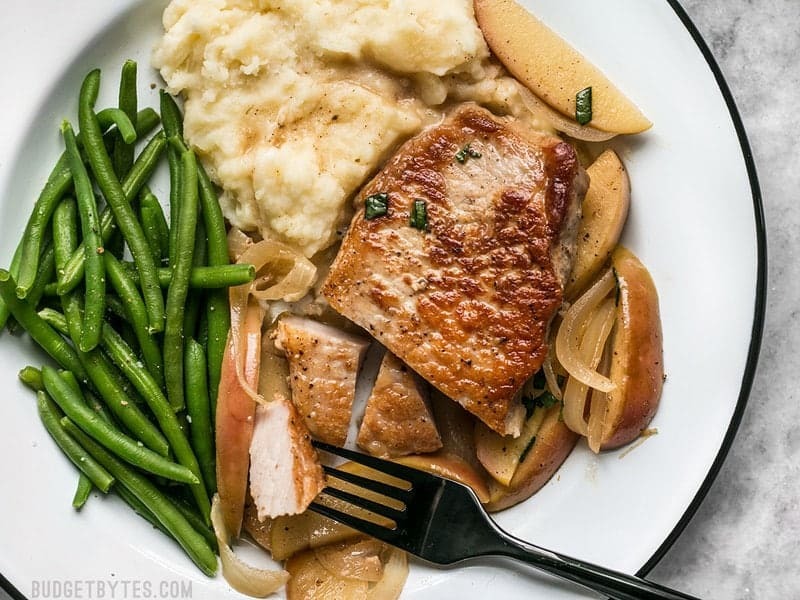 These Apple Spice Pork Chops are smothered with apples, onions, cinnamon, and a buttery pan sauce that is sweet, salty, and rich. Heat the vegetable oil in a heavy skillet over medium heat. While the skillet is heating, open the pork chops and season each side with a pinch of salt and freshly ground pepper. Once the oil is hot and shimmering, place the chops in the pan. Cook the chops undisturbed for 5-7 minutes or until the bottoms form a nice brown crust. If your chops are sticking to the pan, that means they have not formed a crust yet. They will “let go” once the crust forms. Flip the chops and cook the second side in the same manner. It should take 5-7 minutes for each side. 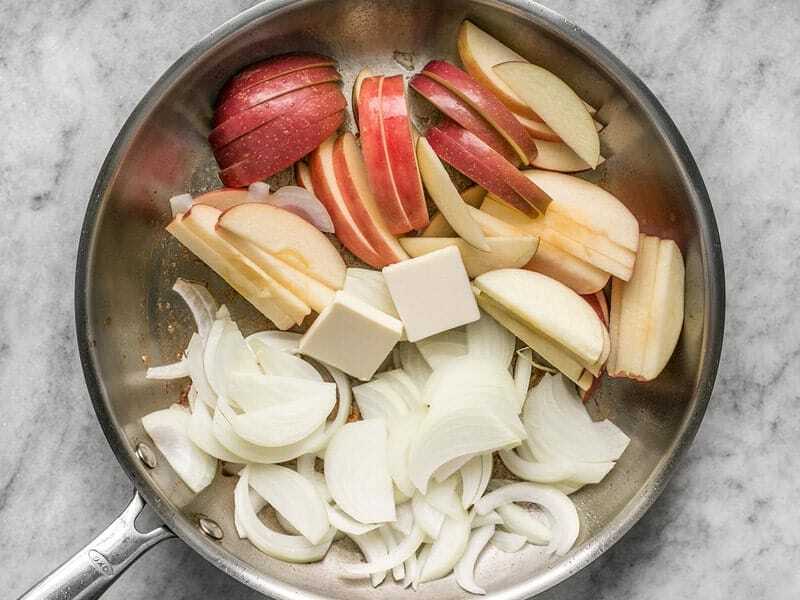 While the chops are searing, thinly slice the onion and slice the apples into wedges. Once the chops have browned on both sides, remove them to a clean plate (they do not need to be cooked through at this point). Add the apples, onions, and butter to the skillet and sauté until the onions are softened. 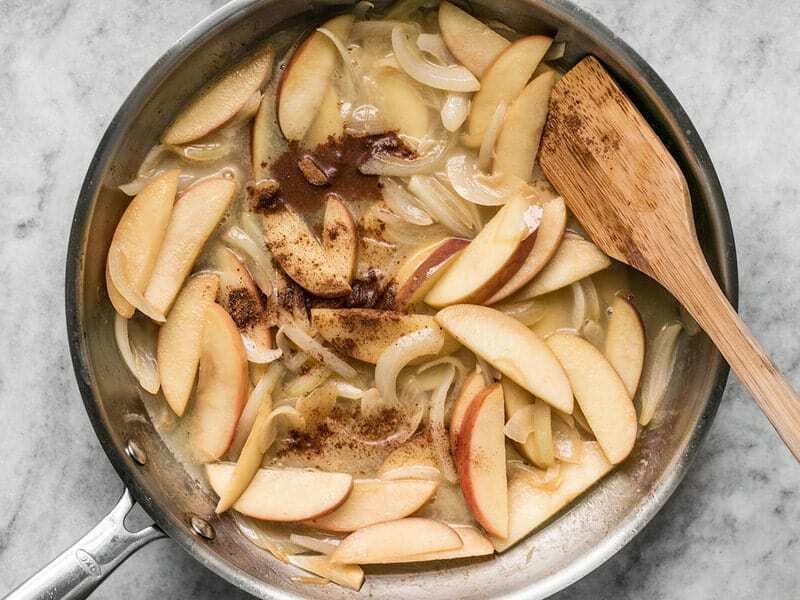 Allow the moisture from the apples and onions to dissolve the browned bits from the skillet as they cook. Add the broth, brown sugar, cinnamon and nutmeg to the skillet with the apples and onions. Stir until everything is combined, then return the chops to the pan, along with any juices that may have collected on the plate. Nestle the chops down in the mixture, making sure some onions and apples are on top of the chops. Simmer the chops in the apple and onion mixture for about 10 minutes, or until the liquid has reduced by half, the apples are soft, and the pork chops are cooked through. Stir occasionally, moving the apples and onions around so they all have a chance to simmer and soften. Serve each chop with apples, onions and sauce spooned over top. Season both sides of four pork chops with a pinch of salt and pepper. I used boneless, but you can use bone-in, if you prefer. Heat a large skillet over medium, then once hot add 2 Tbsp vegetable oil. Swirl the skillet to coat the surface in oil, then add the pork chops. Let them cook until browned on one side (about 5-7 minutes), then flip and cook until browned on the second side. It’s important not to move them around while they are browning. They may stick to the skillet a little at first, but they will release when they develop that nice brown crust. Once browned on both sides, remove the chops to a clean plate. They do not need to be fully cooked through at this point. 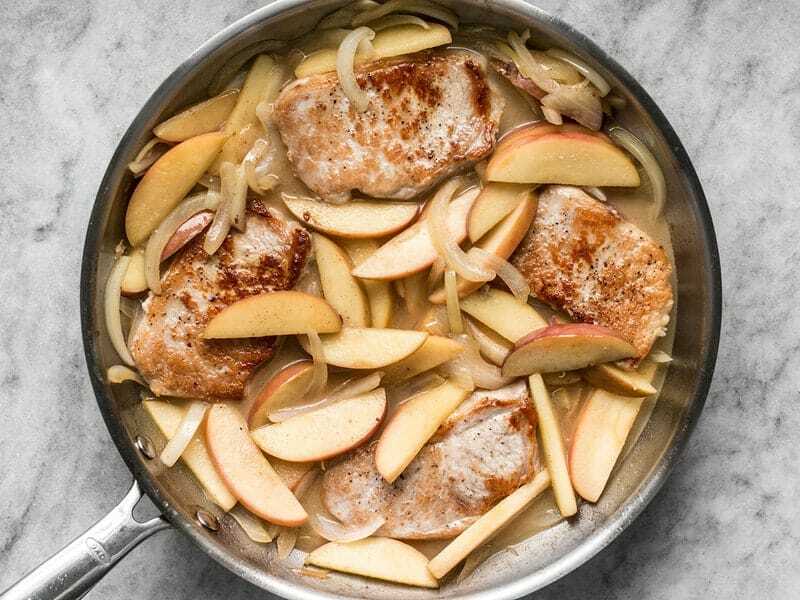 While the pork chops are cooking, thinly slice one yellow onion and slice two apples into thin wedges. 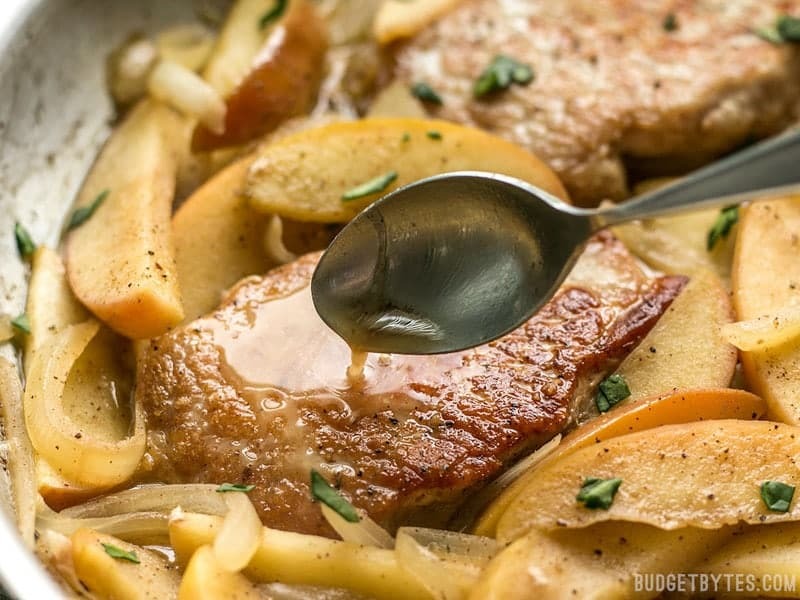 After removing the pork chops from the skillet, add the apples, onions, and 2 Tbsp butter. 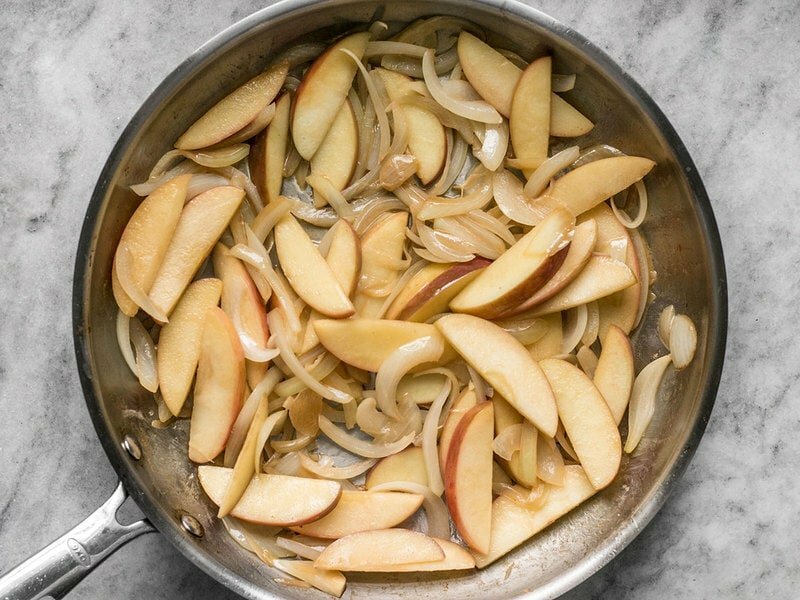 Sauté the apples and onions until the onions are softened and the juices from the apples and onions have dissolved all the browned bits of pork from the bottom of the skillet. Once the onions have softened, add 1 cup chicken broth, 1 Tbsp brown sugar, 1/4 tsp cinnamon, and 1/8 tsp nutmeg. Stir everything together until combined. 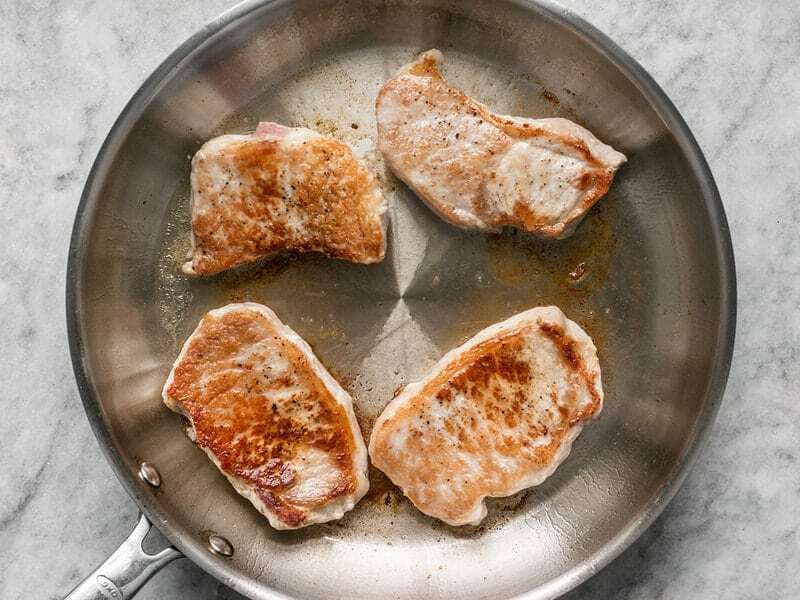 Return the pork chops back to the skillet, along with any juices that collected on the plate, and nestle them down into all of that goodness. Allow the broth to come up to a strong simmer, then let the chops simmer in the liquid for about 10 minutes, or until the liquid is slightly thickened and the apples are soft. 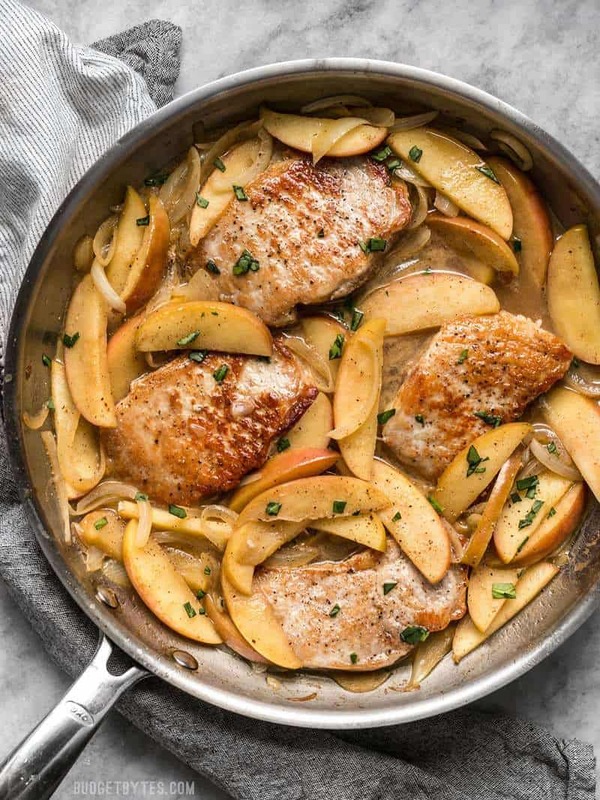 The pork chops should be cooked through, the apples tender, and the pan sauce should be absolutely SCRUMPTIOUS. 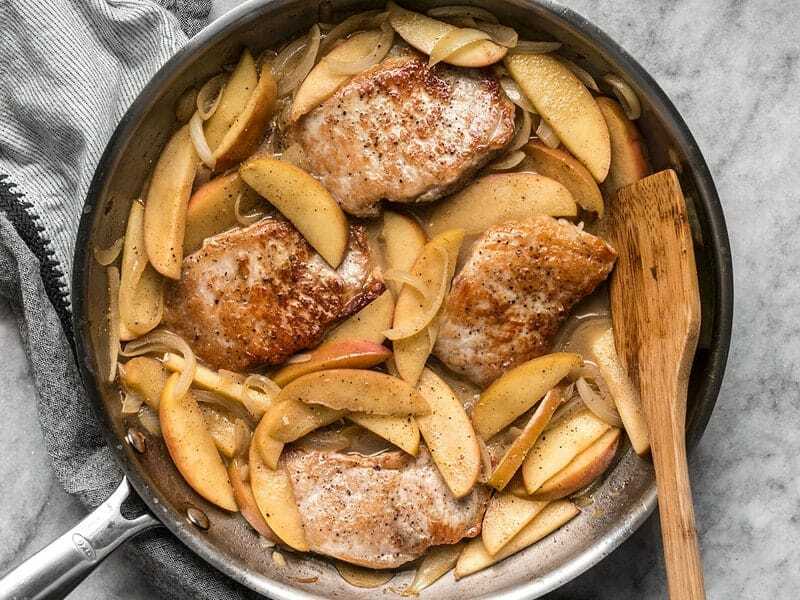 Make sure you serve your Apple Spice Pork Chops with plenty of the apples and onions from the skillet, plus a couple spoonfuls of that amazing sauce! Beth, I don’t eat pork for religious reasons. Will this work with chicken thighs? The whole family loved this recipe! It’s so delicious! Thank you! Thanks for the easy recipe. It turned out great. I used bone in chops and they were very tender. Odd to me have the apples taste like onions but we gobbled it up! This is so so good! Thanks for sharing! Hi, I just made this for my meal prep. I used sweet potato mash instead, but this was sooo good and juicy. Thank you for the recipe! LOVE that combo!! Great thinking! Don’t know why you are calling my e-mail invalid????? Do you think this would freeze well? Even if the porkchops had been frozen and then defrosted? I feel like this one wouldn’t be so great to freeze. I’m not so sure the pan sauce would hold up well.